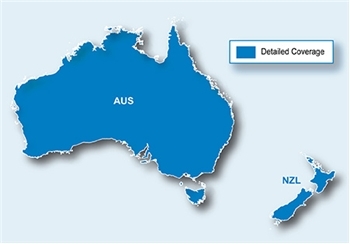 Garmin MapSource City Navigator Australia and New Zealand on microSD/SD. Special Order Item, please allow approximately 4-5 days for shipment. When used with your Garmin compatible GPS device, the Garmin City Navigator Australia and New Zealand on micro SD/SD is a vital tool for exploring and traveling the streets of Australia and New Zealand with tremendous confidence and ease. With Garmin City Navigator’s first-rate NAVTEQ Map Data you can rest assured you will receive the most up-to-date, detailed maps of Australia and New Zealand including local roads, motorways, and national and regional thoroughfares. The Garmin City Navigator provides the user with excellent coverage including over 760,000 miles of roads throughout Australia and New Zealand. When paired with your compatible GPS device you will receive “turn-by-turn” directions that actually inform you where to turn by speaking the street name (example, “Turn right on Main Street”) You can also locate your local favorite hot-spots, and other points of interest easily with over 640,000 points of interest included such as restaurants, gas stations, lodging, attractions, railways, and more. Additional features include navigational elements such as turn restrictions, roundabout guidance and speed categories as well as traffic data for compatible devices that use traffic receivers.